Tugboat prepares to guide a barge loaded with concrete power poles from Central Power and Light towards a reef site. It’s hard to image a pile of scrapped concrete culverts becoming an undersea oasis. 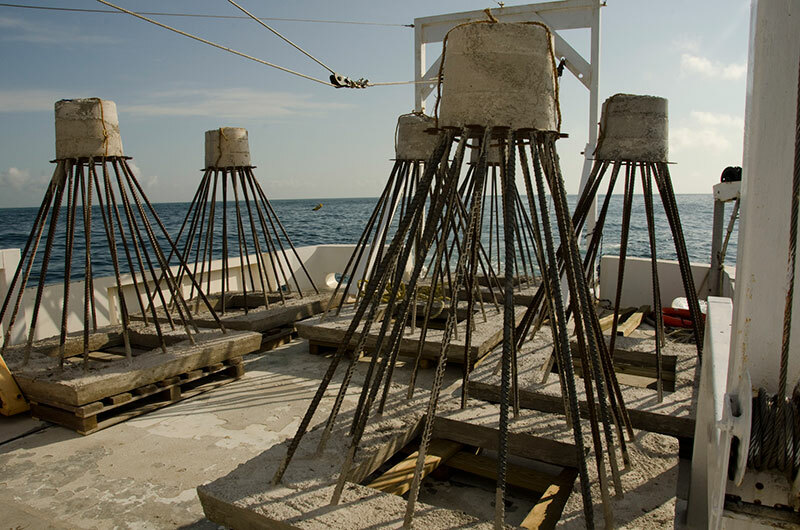 But with the assistance of Texas Parks and Wildlife, properly permitted materials can become the foundation for nearshore artificial reefs, creating more accessible habitats and bringing marine life closer to anglers and divers. Artificial reefs support marine life that develops into complex undersea communities. Materials that can be used in the construction of artificial reef units must be chosen with safety to the marine environment, durability and stability in mind. 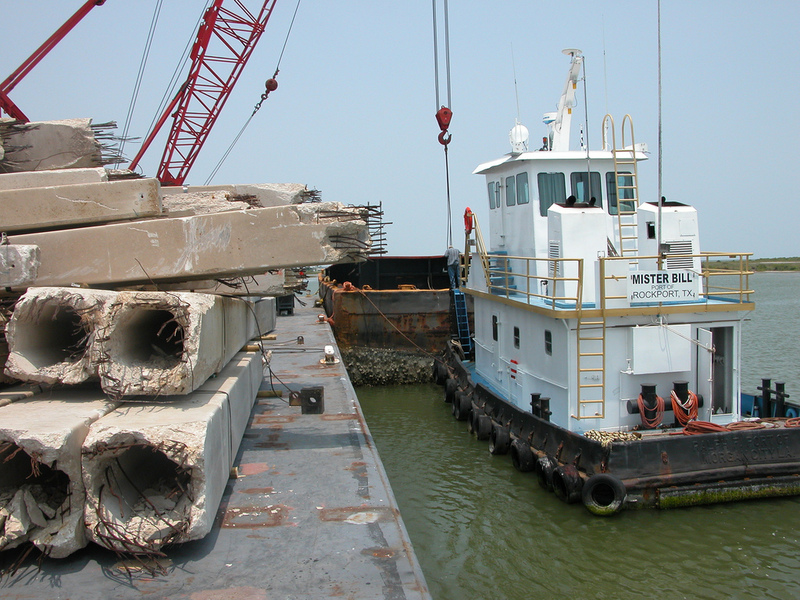 The Public Reefing Program is designed to allow private citizens, organizations and corporations to deploy their own artificial reef materials under the guidance of TPWD. While reefs created from oil rigs and larger ships are generally located 30 miles or more offshore, the Public Reefing Program creates reefs in closer waters more accessible to fishermen and divers. Stable (does not move, which means it should be at least one ton in weight). Durable (will last a number of years, such as steel or concrete). Complex (have a lot of spaces or openings for marine life to hide in). Suitable materials can include concrete culverts 36” in diameter and larger, large-sized steel piping, bridge material such as jersey barriers or columns/spans or one-ton quarry rock. All materials are evaluated to ensure they meet the criteria for reefing purposes as described in Guidelines for Marine Artificial Reef Materials (PDF, 50 KB). Nearshore reefs increase the economic potential of coastal communities, bringing tourism dollars from visitors interested in sport fishing and diving and supporting the new and expanded businesses that serve them. Since these reefs are closer to major ports, charter operations benefit from fuel cost savings and increased business. Anglers generally contribute more than $1,000,000 to a local economy per year, and divers will contribute twice that in coastal communities with an attraction such as the Clipper ship reef. Research shows anglers enjoy fishing trips more if they stay closer to the coast. We estimate that more than 52,000 anglers and 6,000 divers visit TPWD artificial reef sites on charter boats every year. With an estimated 900,000 saltwater anglers and 250,000 divers in Texas, demand remains high for fishing and diving opportunities at these reef sites.